I’ve spent the last three weeks canning various vegetables from my garden and fruit from my favorite local farmers’ market. The other day when I was canning green beans I started thinking about Aunt Bessie–not that she’s ever far from my mind these days as Christy and I work on Beloved Woman, Appalachian Journey Book 3–and how Daddy told me she canned everything. And I do mean everything, squirrel (ew! ), sausage, soups and stews, jams and jellies, pickles,and of course, vegetables she grew in her garden. He told me one of her favorite ways to preserve food was stringing “leather britches” of string beans but he said she also canned them. First, just as I suspected, pressure canners weren’t available to the public until about 1917 or so and when I called Daddy he said Aunt Bessie always used a boiling water canner. My next question was how did she can green beans and other low-acid foods that require a pressue canner today. So I moved on to the history of home food preservation and that’s where I found a goldmine of interesting information. From Pick Your Own: Napolean is often credited with the invention of modern canning: in 1795 the French military offered a cash prize of 12,000 francs for a new method to preserve food. 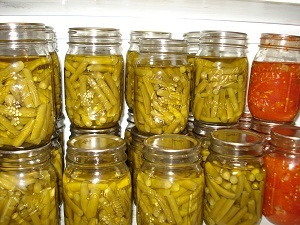 Nicolas Appert suggested canning and the process was first proven in 1806. Until 1858, canning jars used a glass jar, a tin flat lid, and sealing wax, which was not reusable and messy! 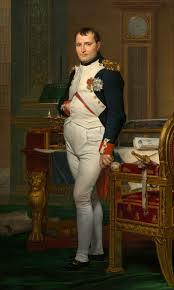 Napolean? Wow, never would’ve guessed that! On the Freund Container & Supply – A Visual History of the Mason Jar (very cool timeline) site I learned about the Mason jars we all know and love–they’re not just for canning anymore! They were invented in the early 1800s by John L. Mason who perfected and patented them in 1858. When the patent expired around 1880, other jars followed, including the Lightning Jar (the ones with the metal clamp around the glass lid), Ball jars and then Kerr jars. And the lids went through several transformations, too. It was recognized that bacteria may be killed at the temperature of boiling water, but that spores retain vitality for long times at that temperature and will germinate upon cooling. The type of sterilizing heat process recommended was fractional sterilization – “the whole secret of canning” (Breazeale, 1909). The complete sterilization of a vegetable required that one heat the vegetable in the jar to the boiling point of water and maintain that temperature for one hour each of two or three successive days. The first day of boiling was to kill molds and almost all the bacteria, but not spores. The spores were thought to germinate upon cooling, and boiling the second and third days killed the new bacteria. 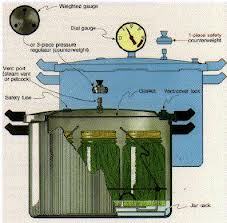 If fractional sterilization were not practiced, about five hours of boiling on the first day was recommended. Yikes! Three days or five hours to can green beans? I love green beans but three days? Like a lot of things we’ve been researching; washing clothes and ironing for example, it sure was a lot harder to can back then. Would I have done it? Probably since that was the only way to preserve food but I wouldn’t have enjoyed it as much as I do today. For me, canning is more like a hobby. It’s one of the few forms of cooking I really enjoy. But back when Aunt Bessie was doing it, it was a job–and a hard job at that. Just makes me admire her and all the women of that time period more than I already did! …and as few people know, David Letterman’s alma mater Ball State University was named for the Ball family and the large canning jar factory that they located in Muncie Indiana (where the University is) home of the BSU Cardinals –chirp chirp! 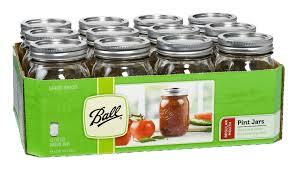 As a fan of David Letterman I knew he went to Ball University but I had no idea it was named for the Ball family and their canning jars. They have a wonderful website–I could spend hours on there–and their Blue Book is the first one I go to when I have a question about canning or need a recipe. Thanks, Mom, for the info and the comment! So interesting! I’ve shared everywhere I can think! Thanks so much, Christy! Love you! Love it. I learned how to can on my great grandmother’s Queen Anne stove. My aunt had taken it from the farm when the farm was sold. Now why would anyone have a Queen Anne in the basement – well, it’s because my Aunt (actually my great aunt) learned to can on it and couldn’t figure out how to move with the times. She didn’t trust her canning any other way. As a child it was fun and unique. 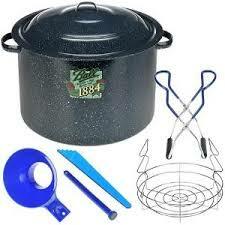 As an adult with a trusty pressure canner – I would scratch my head and wonder at the amount of time it took. I have three generations of Ball books. I use them all. I would love to find some of the old bail top jars. Not to use, well maybe for jams, but for pretty. Oh, Kait, I envy you learning to can from your great aunt. Bet she taught you lots of neat tricks. I also envy you those Ball books! Would love to see them. Mine is almost 20 years old and I keep drooling over the current edition every time I see it! Thanks for commenting! Thanks so much Christy. I don’t can, but I freeze. I keep thinking one of these summers I’m gonna do it. In comparison, maybe it’s not the chore I think it is. LOL!!!! Hi, Linda. Actually, Christy doesn’t can but she’s interested in learning and I’d love to teach her if we can ever find the time. I’ve never had much luck with freezing so I rarely freeze anything. I really enjoy canning and I bet you would, too. Thanks for the comment!